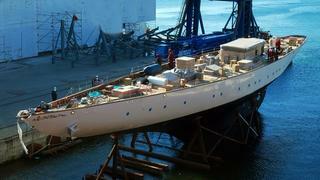 Much activity at Factoria Naval Marín this week with news of the launch of a 47.21m two-masted schooner. It's also the second major launch at this Spanish yard in the past few days. This schooner, currently known as hull number Y105, is a replica of Germania, the schooner designed in 1908 by Max Oertz for the German Kaiser Wilhelm II. Spars included, she has a LOA of 59.60m. Germanischer Lloyd registered and MCA compliant, she's built in steel with wooden deckhouses and rig. Her interior is designed by Oliver Design, and accommodation is for 10 guests in five cabins plus a crew of 13. In the engine room a single Deutz engine of 300kW will power the yacht in conditions of light or no winds. Conceived for world-wide cruising, Y105 will be delivered this Summer.